This cute a line skirt looks so great for office wear, as it's modest bust also trendy--it's like a modern take on an a line skirt. I love it. A mini skirt paired with a longer sleeve blouse in a darker color makes this a little warmer for those chilly late summer nights. A sweet summer dress like this is perfectly paired with brown wide sandals to bring this white ensemble into Fall territory. A great way to keep the summer vibe without looking super out-of-season is to pair your summer item with a different season item, like a suede maxi skirt. As a plus sized gal, online shopping is really hard when you can't actually try stuff on. 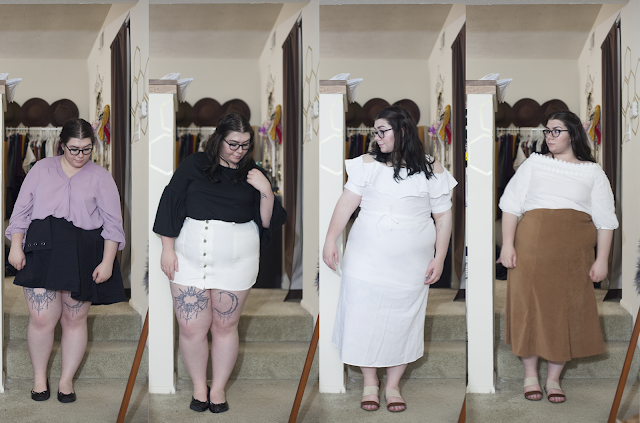 I'm in the middle range where I can wear a standard XL in most things and a 1X in plus size. ZanStyle has a decent amount of XL and a few extended sizes to accommodate a range of people. The size guide is accurate, which is great if you measure yourself before buying clothing. I'm pretty happy with these items and they are great quality. ZanStyle was originally an Amazon store that has branched out to their own site, and that's inspiring to other Amazon sellers. Ultimately, I would recommend ZanStyle if you're into trendy pieces and if you know your measurements well. If you're on the more plus sized spectrum, they may not be the best choice, as there are only a few garments that are extended sizes.